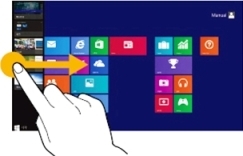 Using touchscreen in Windows 8 enabled Samsung ATIV devices. Samsung ATIV Book9 Plus/Lite comes with a touchscreen. It allow users to access apps with a simple touch on the screen. That means it gives freedom from using touchpad on Notebook. Swipe inward from the left edge. Swipe downward from the top edge, or swipe upward form the bottom edge. Displays the options for the currently running App. Swipe upward on the Start screen. A tile of all apps installed is displayed. Swipe downward from the top on the All Apps screen. Swipe downward from the top edge. Exit all the currentlly running apps. Slightly press twice with your fringer to select an item. Moves the selected target or moves to the next page. You can draw a picture of write some letters with this operation. Spreading 2 fingers widely of bringing them towards each other. Touching and holding for a while. Provides the same function as right-clicking your mouse button. Displays the additional options which can be set for the selected target of more detailed information. Touching and dragging 2 fingers up/down, left/right. Move up/down, left/right. Provides the same function as scrolling your mouse. What is All Share feature in Samsung Devices? 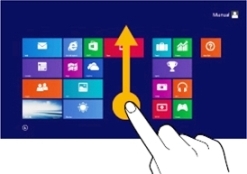 What are Keyboard shortcuts used to View Webpages in Windows 8 enabled Samsung device? What is DIMM and SO-DIMM Slot?